I’ve been using this as a dock for the rare time i work from home, i can plug my two home PC monitors into my work laptop without a lot of wires. Nice to have the big screens to work on at home. I received this product in exchange for an unbiased review. Purchased this to add a second monitor to my HP Envy All-In-One system. I use this computer for work at home and needed another display. Setup was easy. The only variation from the directions was related to the USB Video Adapter Icon. I do not have an icon displayed on my System Tray. I viewed Devices, right-clicked the monitor, and edited the settings. Was able to switch the monitor order as desired. Everything is working as expected. 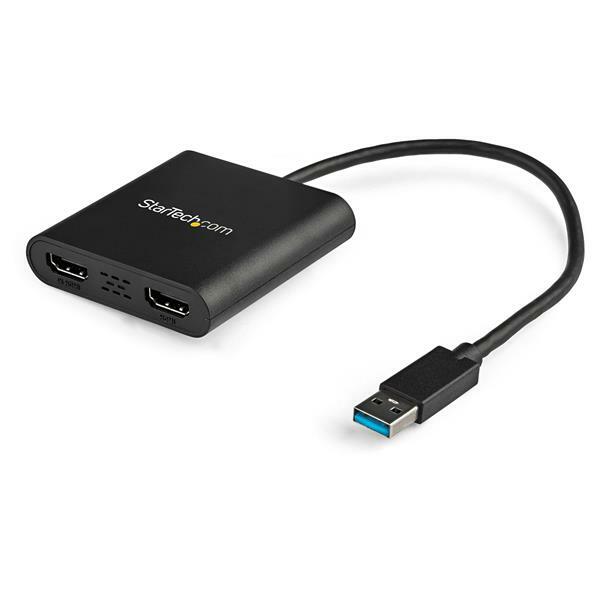 This adaptor is an awesome plug and play, very easy to setup under Windows 10 and I use it for demo presentations when I'm on the road to visit prospective clients. The quality of the image is great and I didn't experience any freezing or delays. The adaptor itself comes in a small box and fits on my ultrabook bag. The instructions are well explained but I doubt you will need it. I haven't tried it on a MAC but for Windows users, it is a GO! "I received this product in exchange for an unbiased review"
I have used this USB to HDMI adaptor with several computers and it always connects and works well. The adaptor comes in a box about the size of three DVD cases. The adaptor's size is slightly smaller than the palm of my hand. The cable coming out is about a foot long and very flexible. It comes with instructions but I don't think they are needed as you just have to plug it in to start using it. When I connect this device to a new computer it takes about 30 seconds to detect, install and start working. Future connections only take seconds before it is working. The response time is very quick for the display and I can't notice any lagging. Only one port works with 4K, but I can use both ports with 1080p displays. I like the fact that I can connect this to any computer and I don't have to worry about what type of video out port the computer has. This adaptor works consistently well and quickly. I received this product in exchange for an unbiased review. I used this on my laptop to output to 2 60" tv's in our conference room. Easy setup and great picture quality. 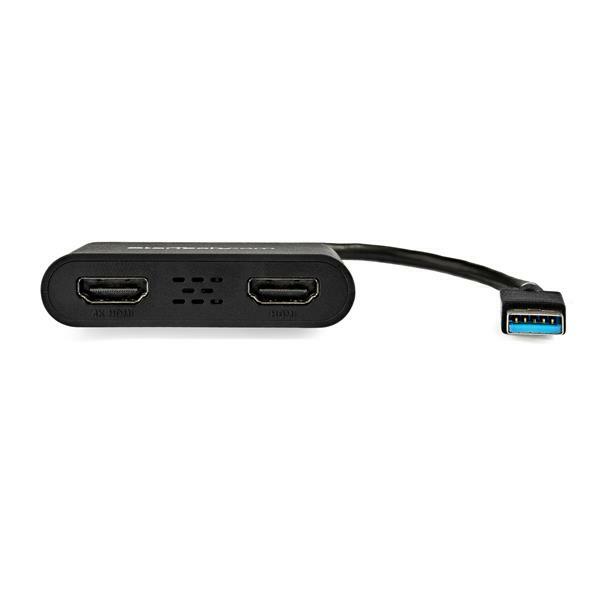 (5 stars) USB to Dual HDMI with no external power source! Wow! No external power source required when I connect two HDMI displays through a single USB port on my laptop. This is amazing! The picture quality is great and does not take up too much room in my bag when I am on the road. This is fantastic for the mobile worker or for sales presentations. I received this product in exchange for an unbiased review. Installation of this was so easy. Plugged it in and Windows 10 did its thing and instantly installed the video and audio driver for this device and voila it was up on the screen. Startech gives you instructions for getting this device to work but I did not need them, it just worked. The image quality was good and there was no latency issued that I experienced for basic work. Great little product !